LAWPRO is committed to treating all people in a way that allows them to maintain their dignity and independence. We are committed to meeting the needs of persons with disabilities in a timely manner, and will do so by preventing and removing barriers to accessibility and meeting accessibility requirements under the Integrated Accessibility Standards Regulation (“IASR”) enacted under the Accessibility for Ontarians with Disabilities Act, 2005 (“AODA”). LAWPRO’s Multi-year Accessibility Plan, Disability Accommodation Plan, and Accessibility Policy work together to outline how LAWPRO provides inclusive and accessible services to all persons with disabilities and improves opportunities for them. The Multi-year Accessibility Plan outlines LAWPRO’s strategy to prevent and remove barriers and meet our obligations under the IASR. It focuses on LAWPRO’s accessibility achievements to date and future steps LAWPRO will take to comply with Ontario’s accessibility laws. We will review and update this plan at least once every five years. The plan incorporates LAWPRO’s accessibility initiatives in the areas of customer service, training, information and communications, and employment standards. Information will be made available in an accessible format, upon request. LAWPRO is committed to providing our services in a way that respects the dignity and independence of persons with disabilities. We are also committed to preventing, identifying, and removing barriers that impede the ability of persons with disabilities to access our services. These commitments will be integrated wherever possible and will ensure that persons with disabilities will benefit from the same services, in the same place and in a similar way as other customers. 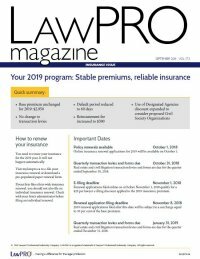 LAWPRO is committed to ensuring that every employee and customer receives equitable treatment with respect to employment and services, without discrimination, and receives accommodation where required, in accordance with the provisions of the Ontario Human Rights Code and the AODA and its Regulations. LAWPRO will meet the accessibility needs of persons with disabilities in a timely manner. LAWPRO is committed to excellence in serving all customers, including persons with disabilities, and it will carry out its functions in a manner which delivers an accessible customer service experience. LAWPRO is committed to providing its services in a way that respects the dignity and independence of persons with disabilities. We will continue to ensure compliance with the customer service standards in the IASR. LAWPRO is committed to making company information and communications accessible to persons with disabilities. LAWPRO will continue to ensure compliance with the current requirements under the information and communication standards in the IASR and incorporate new accessibility requirements, as applicable, to ensure that its information and communications systems and platforms are accessible and are provided in accessible formats that meet the needs of persons with disabilities. The following was implemented by January 1, 2015, in accordance with the IASR. LAWPRO’s existing and new processes for receiving and responding to feedback are accessible to persons with disabilities by providing or arranging for the provision of accessible formats and communication supports, upon request and in a timely manner. The following was implemented by January 1, 2016, in accordance with the IASR. Notifies the public about the availability of accessible formats and communication supports. LAWPRO makes all of its new websites and content on those sites conform to WCAG 2.0, Level A as of January 1, 2014. LAWPRO will make all of its websites and content conform to WCAG 2.0, Level AA by January 1, 2021. LAWPRO is committed to fair and accessible employment practices that attract and retain employees with disabilities. This includes identifying and removing barriers and providing accessibility across all stages of the employment cycle. LAWPRO will continue to ensure compliance with the current requirements under the employment standards in the IASR and incorporate new accessibility requirements as applicable. Specifying that accommodation is available for applicants with disabilities on LAWPRO’s website and on job postings. If a selected applicant requests an accommodation, consultation with the applicant and arrangements for provision of suitable accommodations in a manner that takes into account the applicant’s accessibility needs due to disability. Inclusion of notification of LAWPRO’s policies on accommodating employees with disabilities in offer of employment letters. In meeting the obligations to provide the information that is set out in the paragraph above, LAWPRO consults with the requesting employee in determining the suitability of an accessible format or communication support. LAWPRO has in place a written process for the development of documented individual accommodation plans for employees with a disability, if such plans are required. LAWPRO has a documented return to work process for its employees who have been absent from work due to a disability and require disability-related accommodations in order to return to work. This process outlines the steps LAWPRO will take to facilitate the employee’s return to work after a disability-related absence and the process for development of a written individualized return to work plan for such employees. LAWPRO uses individual accommodation plans in this return to work process. LAWPRO takes the accessibility needs of employees with disabilities and, as applicable, their individualized accommodation plans, into account when managing performance, career development and advancement, and when redeployment is required. LAWPRO is committed to providing appropriate training on the elements of the IASR and the Ontario Human Rights Code that pertain to persons with disabilities as soon as is practicable. Ensures that training is provided on any changes to the prescribed policies on an ongoing basis.